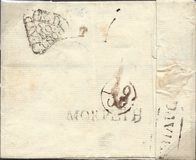 1874 6d Grey, SG 147, Plate 13, Pair and two 3d Rose, SG 143, Plate 14, tied to cover to Lisbon, Portugal by very fine NEWCASTLE ON TYNE 545 duplex. A VERY FINE AND ATTRACTIVE COVER. 1856 REGISTERED ENTIRE addressed to Clay, Nr. Holt, Norfolk, franked by a 1d Red-Brown, SG 29, and a very fine four-margin EMBOSSED 6d PURPLE, SG 60, tied by very fine Newcastle on Tyne 545 numerals. Very Attrractive. Circa 1900 1d Pink envelope with a Northern British Railway Company 2d stamp, both with CHOLLERFORD/STATION/N. 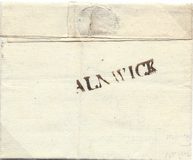 B. Ry cancellations, addressed to Alnwick and in manuscript "To be called for at Alnwick Station". 1857 4d Rose-Carmine, SG 66, tied to cover to Durham by a fine TYPE III NEWCASTLE-ON-TYNE SIDEWAYS DUPLEX. 1654 Letter regarding information and names of those involved in the HAYDEN BRIDGE, NORTHUMBERLAND RIOTS. 1849 REGISTERED Entire from Newcastle on Tyne to Naples showing "crown/Registered" of London together with various other datestamps and oval 'PD' in red. 1844 Entire addressed locally to Matfen Hall Office with, on the front, a very fine HAYDON BRIDGE Handstruck '2' POSTAGE DUE in BLACK, NR 325. 1821 Cover from Edinburgh to Ambleside showing on the front a very fine framed "MISSENT TO/BERWICK" in black. 1843 Entire to Malpin Hall with, on the front a very fine HAYDON BRIDGE Handstruck '2' POSTAGE DUE IN BLUE. 1841 Cover to London showing a fine ALLENDALE/PENNY POST on the reverse, NR 3. 1829 Cover to London with, on the reverse, a very fine circular ALNWICK with mileage removed, NR 36. 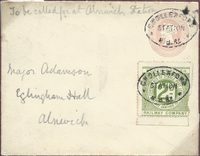 1776 Entire addressed to Unthank showing on the reverse a very fine ALNWICK NR 12? 1840 1d Black, SG 2, Plate 6, O-I. A very fine four-margin example tied to cover to Hexham by a very fine ALNWICK MALTESE CROSS in red, dated JA 21ST 1841 - Late Use of Red Maltese Cross. 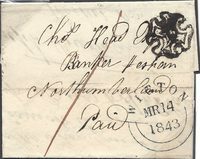 1840 1d Mulready Letter Sheet addressed to Brixton and cancelled by a very fine NEWCASTLE ON TYNE Maltese Cross in Red.